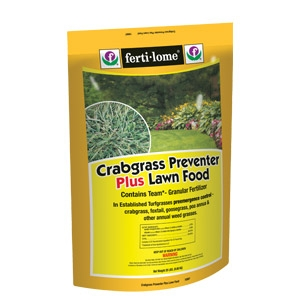 A unique combination of slow release lawn food with trace elements and the pre-emergent Crabgrass control of Team (Treflan and Balan). Team provides 12-16 week pre-emergent Crabgrass control and is one of the best pre-emergent weed control products available. Wait at least 6-8 weeks before sowing grass seed in the lawn. Can be used on both cool and warm season grasses. Cover 5,000 sq. ft. 20 lbs.